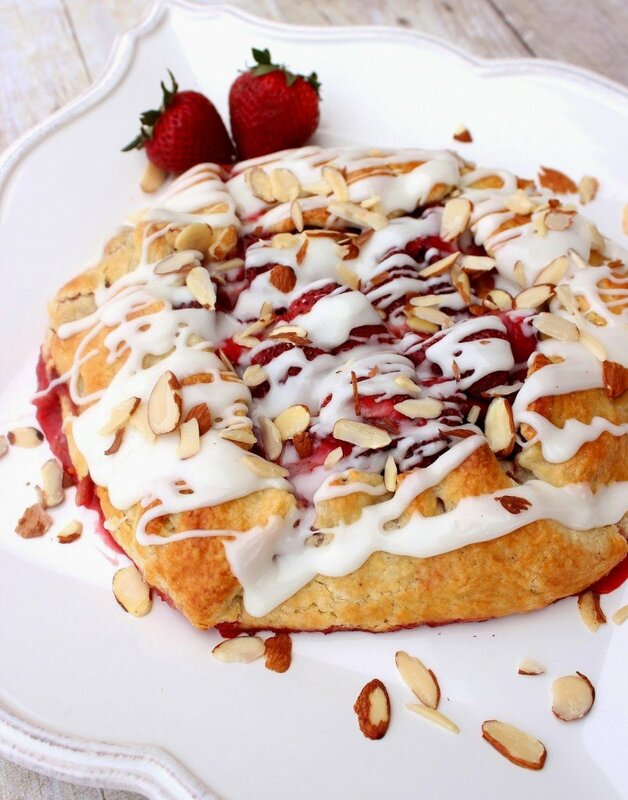 Hello everyone and welcome to this #SundaySupper edition of “Easter/Passover feast.” For this grand occasion, I’ve made a Strawberry Crostata with Sweet Almond Glaze to bring to the table, and to share in the feast. This is one of the prettiest (in a rustic sort of way) desserts I’ve ever made and it makes for a perfect end to any sort of celebration meal, or maybe even just a Monday or Tuesday night. Bring this Strawberry Crostata to the table and any occasion has been instantly upgraded to something truly special…and delicious! -In food processor, pulse the flour, sugar, salt and butter to form coarse crumbs. -Add in the ice water and almond extract and pulse again just until the mixture forms a ball. Do not over mix. -Turn the dough out onto a lightly floured surface and shape it into a disc. -Wrap in plastic wrap and chill in the refrigerator at least 30 minutes. -In a medium bowl, stir together the sliced strawberries, sugar. Set aside while the dough chills. -Drain the strawberries after they’ve sat for 30 minutes and then stir in the flour. -On a lightly floured surface roll out the chilled dough to form roughly a 12″ circle. *Note – Don’t worry about it looking rough around the edges, It’s not supposed to be perfect! -Using the rolling pin, carefully transfer the rolled pastry to a parchment lined baking sheet or a baking stone (which is what I used) *Note – This is done by draping the dough loosely over the rolling pin and then unrolling it once it’s on the parchment. 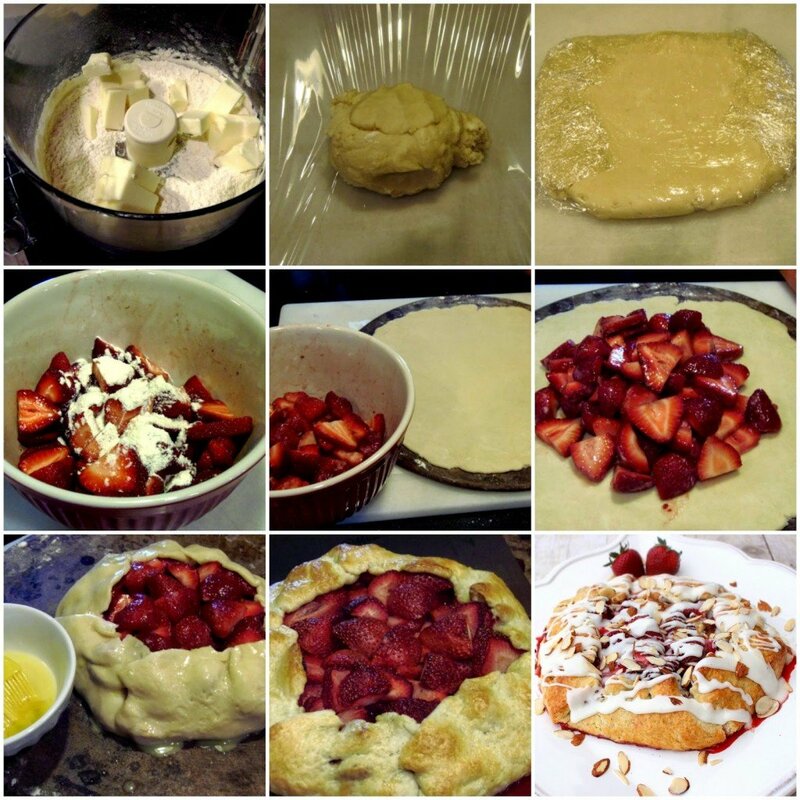 -Mound the drained strawberries in the center of the dough, making sure to leave about a 2-3″ border around the edges. -Carefully turn the edges of the dough up and over the outer edges of the strawberries. -In a small bowl, whisk together the egg and water and gently brush the dough with the egg wash.
-Bake in a preheated oven for 40-45 minutes, or until the crust is a nice golden brown and the juices from the strawberries have started to escape. -Remove from the oven and allow it to cool completely before transferring it to a serving plate. -In a small bowl, whisk together the powdered sugar and almond extract until it is a nice, thick but runny consistency. *Note – if the glaze is too thick, add a little water. If the glaze is too thin, add a little more powdered sugar. -Drizzle the sweet almond glaze over the crostata and top with the slivered almonds. Trust me, you’re going to LOVE this!!! Thank you so much for joining me on this extra special day of resurrection and renewal. I also send out a big thank you to Alaiyo of The Pescetarian Journal for hosting this week’s #SundaySupper. Join the #SundaySupper conversation on twitter on Sunday! We tweet throughout the day and share recipes from all over the world. Our weekly chat starts at 7:00 pm ET. Follow the#SundaySupper hashtag and remember to include it in your tweets to join in the chat. Check out our#SundaySupper Pinterest board for more fabulous recipes and food photos. Crostata is my favourite cake. I have always loved since I was a child. I love it as it is very versatile and it tastes great with any flavour. 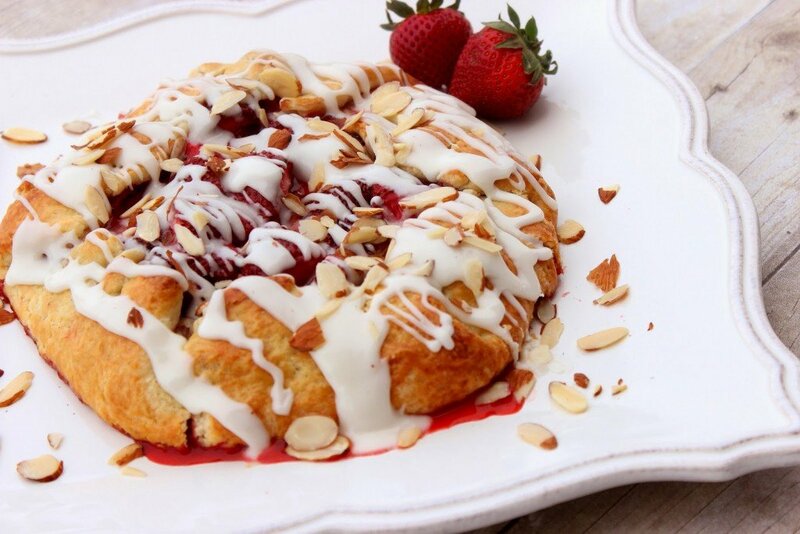 This strawberry version sounds great and I love the glaze on it! Darn it, I am soooooo drooling right now! Your Crostata looks out of this world and I want this right now! What a gorgeous crostata, Renee! And the glaze pushes it over the top! Happy Easter, my friend! Oh my, Oh my! This is beautiful and looks so yummy!!!! Happy Easter! You come sit next to me with that crostata! I know it's pretty easy but it looks so very elegant. I want to dive right in, it looks so amazing! That is one gorgeous dessert. It might be a "rustic" crostata, but it looks so fancy! Wow, wow, wow, how amazing, I love this!! I'll take two please (one for now, one for later) 🙂 ! I'm not familiar with a crostata, but yours looks absolutely amazing! I can't get over how pretty this is! Can't wait for strawberries to be in season here! This is lovely! 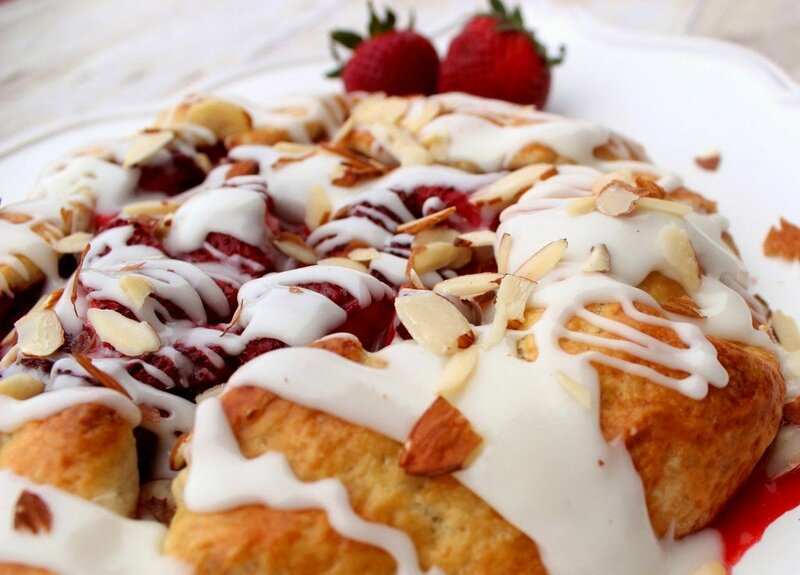 That almond glaze looks wonderful. Wishing you and your family a lovely Easter Renee. Renee, so lovely!!! I want THIS for my Sunday brunch!!! yum! so beautiful and delicious! This crostata is GORGEOUS! I love these flavors together too. Makes me think of spring! Beautiful and perfect for Easter and spring celebrations! Oh my gosh, this reminds me of something a had down in Florida a few months ago. I need this in my life asap!